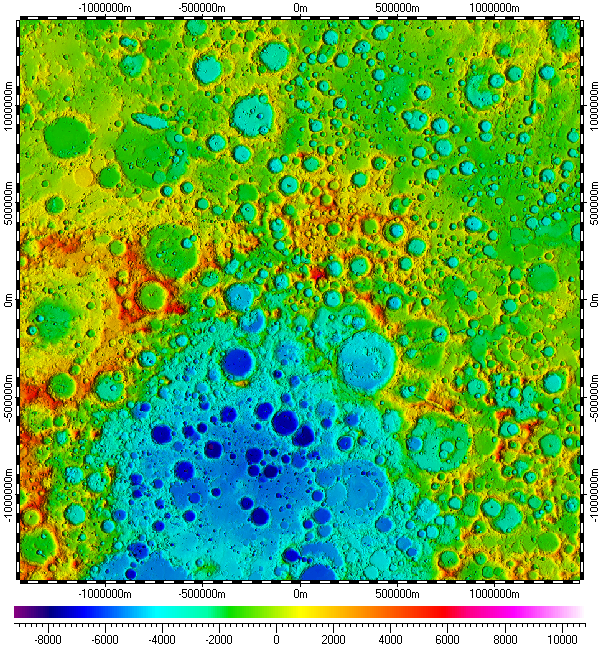 The datum of Digital Elevation Model of South Pole of Moon, included in the archive, derived from raster data of Lunar Orbiter Laser Altimeter (LOLA) experiment, version 2.0, which was part of Lunar Reconnaissance Orbiter (LRO) mission, and distributed by Planetary Data System (PDS) of NASA. The datum has multiple resolutions, utilizing data resolution from 100m to 5m. The data uses Polar Stereographic Projection with true scale latitude of -90°. Also the datum contents set of spatial regions representing limiting areas for each primary used data of respective resolutions. MoonSouthPole_.zip - Size: 1,950,560,798 bytes (1.81 GB); MD5: 843D5F203D801C2BBF3EE7FDC72AA436. _MoonSouth34.zip - Size: 1,297,675,576 bytes (1.20 GB); MD5: 2E8910DA91F538E2C2DE110CA4CA79EE. Files from this set should be kept in a common folder "\South Pole", for example. Only the first file "MoonSouthPole_.zip" will be selected by user upon installation entire datum from this archive by using Spatial Aspect Map Locator. See user manual of the program for more details.